It All Starts With A Question…? Greetings from South Carolina! My name is Jamie Gregory, and I am a public high school media specialist in the Upstate of SC at James F. Byrnes High School. I taught high school English for 8 years (including 1 year of French) and just finished my 4th year as a media specialist. I completed my MLIS degree in 2012 from the University of South Carolina, and I was introduced to the GID model during my time there as a graduate student. While I also learned other inquiry models, I found the GID model particularly effective and applicable because it is research-based. Also, Kuhlthau’s ISP model is life-changing. Reading the research on the emotions and behaviors underlying the research and learning processes really changed how I approached the research process while I was still a classroom English teacher. So, given all this change, my district decided to offer a professional development cohort called Inquiry in the Classroom. 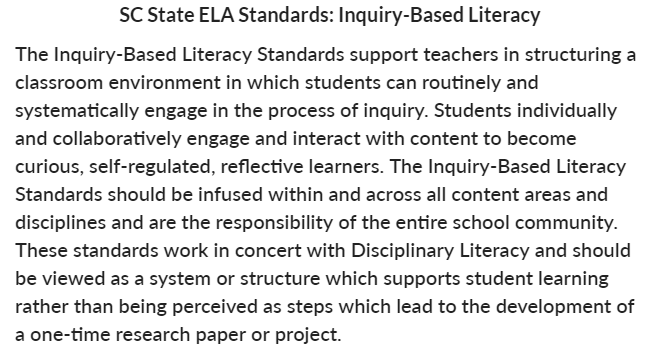 When the head of professional development asked for volunteers to lead it, I knew I wanted to jump in so I could also promote the role of the media specialist in inquiry-based learning. I led Inquiry in the Classroom, a professional development cohort of 18 English, Social Studies, Science, and special education teachers grades 9-12, from January to May of 2017. We met once per month, and I knew I wanted to share the GID model with these teachers. I also knew that I wanted to have teachers begin to implement aspects of inquiry-based learning throughout the semester so that we could have brainstorming sessions at our meetings to share successes and opportunities for improvement. My posts this week are going to feature my collaborations with 3 English teachers at my school: Sarah Plant, Jena Smith, and Michael Jett. They are truly awesome educators and I can’t thank them enough for working with me this past year. I spent a lot of time during the cohort sharing resources about the importance of questioning. (I also highly recommend the book Cultivating Curiosity by Wendy Ostroff!) Meeting students in the Third Space so they can choose topics and ideas that interest them and affect them personally is so important, and educators can help them discover new topics that students didn’t even know they wanted to learn more about! By the time we get our students in grade 10, some students have already “gotten by” with being passive learners. So when they are asked to be curious, ask questions, and engage in real-world issues, they truly aren’t sure what that looks like. But don’t worry, we always have a few tricks up our sleeves! In our March cohort meeting, I had the teachers watch a brief video about coal mining today. I chose this particular video as an example to use with students in a science classroom because information literacy skills can be embedded along with science content knowledge (have students question the source of this video! Challenge them to find a video from an opposite bias!). In order to model how you might use the above handout in the classroom during the Open and Immerse stages, as a cohort we brainstormed some questions we thought we had about coal mining today before watching the video. Then while we watched the video, each person wrote down questions. After the video, we wrote even more questions after sharing! This activity works really well to show students the recursive nature of questioning and learning. Then the bottom of this handout addresses metacognitive skills as well as information literacy skills! So wonderful! Idea #2! For middle and high schoolers, there are a number of wonderful nonfiction series to help students research argumentative topics. We particularly like At Issue, Critical World Issues, Current Controversies, Opposing Viewpoints, and Thinking Critically. Some of these series provide questions as chapter titles, which we used with some classes. Some databases like SIRS Issues Researcher also provide questions related to various topics which can be used for scaffolding. Partner up with your media specialist to learn what resources you already have in your school library! These resources can effectively be used during the Open and Immerse stages, particularly if you have your media specialist set up a gallery walk with stations. In this screenshot, SIRS Issues Researcher (a ProQuest product) suggests various subtopics related to Military Ethics and represents those subtopics by questions! In this screenshot, you can see how SIRS Issues Researcher provides a few critical thinking questions when students click on a topic. Don’t miss the essential question in the background! I will feature ideas and student work from Sarah Plant and my library service learners in tomorrow’s post to continue the discussion about questioning, and I will include how we focused on developing concept-based research assignments. Stay tuned! “Bulldog Brilliance” at its best – Alternative Ed students rock it! For my final post this week, I will talk about the specifics and how the GID process worked beautifully with the Bulldog Brilliance Lab project. Recall that the project this class did was to create a lab with video recording and editing equipment and materials for creating. As I have already stated, I believe that GID is appropriate for all types of learners. This is important and was particularly key because the students in this middle school class ranged in grades from 6th to 8th with varied academic abilities. The flexibility of GID supported this diversity perfectly! The initial planning work on the Bulldog Brilliance Lab took about 4 weeks. The guiding unit question was ‘How does creative expression impact the world” and integrated standards from language arts, math, social studies, information literacy, and art. The unit started by bringing students together to discuss what they thought they could do with a lab where they would be allowed to create. Students shared their ideas and visions through a shared writing experience thinking about how this might impact their learning. To Open, as a group the class looked at student created videos and brainstormed what was necessary to create an actual video. Open was really an inquiry group activity where students shared freely. Immerse was a fantastic field trip to the high school to visit the Video Resource Center (VRC). The VRC is a production studio offering classes in media production. The VRC also manages the District TV channel showcasing footage about events in the district and happenings at the school sites. It was a perfect place for our students to learn firsthand about what equipment was needed. As noted in my second post this week, there was also emotional benefits for our students because of them ‘finding their place at the high school’ making the upcoming transition so much easier. The field trip also motivated students about the project and they came away with great ideas and a new-found confidence. Explore was done primarily through online resources simply because pricing for equipment could change quickly and the available print resources were limited. This provided the perfect opportunity to really strengthen skills for evaluating web sites! 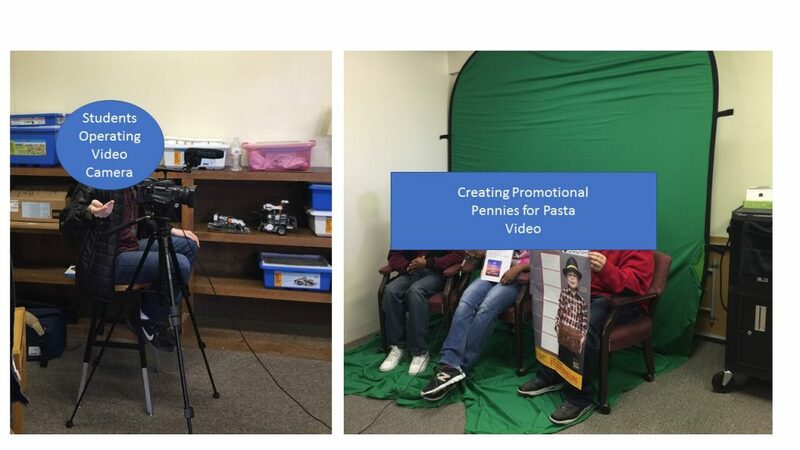 Using resources curated and organized in Google Docs and websites the students located, they learned more about video equipment, labs, creating stations, and fab lab options. Identify was somewhat collaborative because students naturally divided and focused on the equipment and the part of the lab that interested them most. There’s that flexibility again – thank you GID! 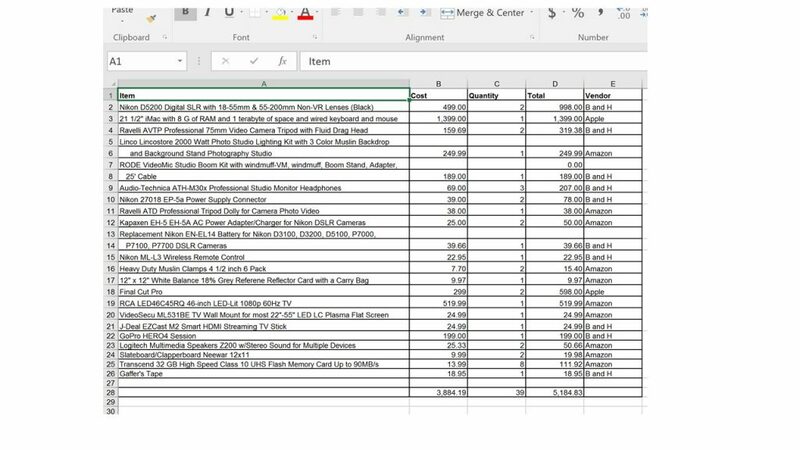 The students consulted another expert from the Computer Lab/Technology Center from the public library to further identify possible equipment and as they Gathered information, it was maintained on a collaborative Google Spreadsheet (see image below). Information included was the name of equipment, pricing, quantity and where the item could be purchased. 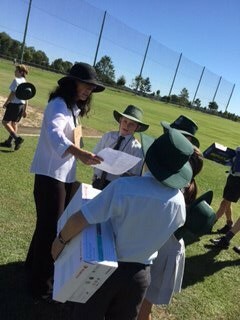 In this phase, there were several inquiry group discussions about the equipment specifications and the students had to justify why they choose one model over another. The Create piece of the project was to work as a team to develop presentations that could be shared when seeking financial support. In this phase, discussions about presenting etiquette was covered. Students recorded themselves using old Flip Camera’s and what we found was when students watched themselves, many of them said ‘I need to practice more’. Talk about a chance to practice writing and speaking skills! Sharing was done through presentations and grant writing where students contributed to the final presentation and work. Students could not be at all presentations and any grants written had to be done through the teachers. None-the-less, student input was invaluable because it was their vision and work! Although we did not get the funding to buy new equipment, as the project was Evaluated using ‘what worked, what did not work, and what would you change next time’ questions, students shared that they were proud of their work and recognized that not everything gets funded. Another really great learning opportunity. As noted in my earlier post, the lab became a reality through donated and repurposed equipment. Once that happened video and creating activity was somewhat ongoing. 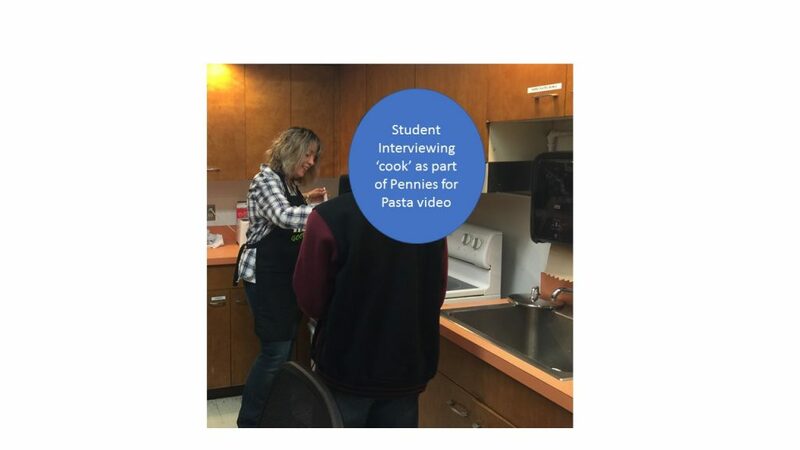 Here are some pictures of student work and production on a promotional video they created for the Pennies for Pasta campaign. (Pennies for Pasta is a fundraising effort to support The Leukemia & Lymphoma Society.) 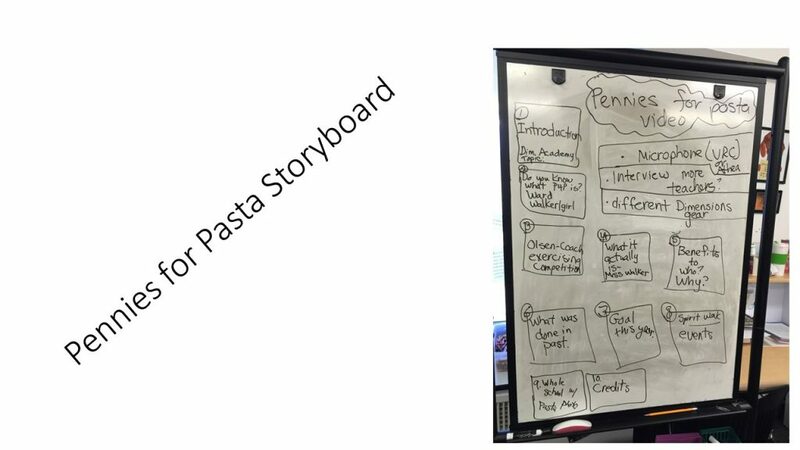 For this video students created a storyboard and plan to include as many teachers and students in the school as possible – of course only those that wanted to be front of the camera – and then collaboratively wrote the script. In this project, it was so great to see the camaraderie happening between students. 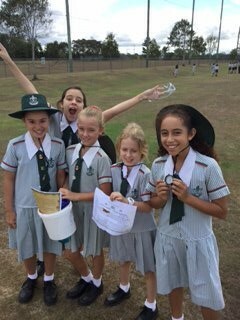 Some students did not want to be in front of the camera so they opted for ‘behind the scenes’ roles and they cheered each other on through the completion. Because we did not get new equipment, the class partnered with the VRC so they could use really good quality equipment for recording and to learn Final Cut Pro for editing. The video aired on the school channel and we were so proud! We observed growth in students in their self-confidence, their ability to use information in an authentic way, their ability to work collaboratively to solve a problem and share information, and their improved overall behavior- and this is attributed to the GID process. To bring this all back around I believe deeply that GID is for all learners and that it provides natural learning scaffolds in every phase no matter the academic ability of the student. By the way, I also believe that GID is great for special education students – but that is perhaps the topic of another week. I hope you enjoyed reading my work and feel free to contact me if you have any questions. As I close my blogging for this week it is with great thanks to Dr. Leslie Maniotes for this opportunity. This is a fantastic chance to reflect and share and I am so glad I did it! I love reflecting. I reflect after every lesson I teach, after a full day’s worth of lessons, after finishing a project, after finishing a parenting task, after everything. I truly believe that I can use reflection to improve my teaching and to improve student learning. Here are my “Big thought” reflections on the guided inquiry process. Collaboration: Collaboration is key. While at the GID Institute, at CiSSL this summer, I was able to plan with a regular education teacher and the school media specialist. We worked very well together. We all three wanted to be there and had a goal in mind. When you make your GID team, you need to make sure everyone has bought in. You will struggle. We struggled. The regular education teacher had to take the perspective of teaching 150 students per day and what she could do with that. I had to take the perspective of the special education teacher and play devils advocate for my students who may not be comfortable with some of the activities or ideas that we had due to their disability. The media specialist was able to give us a completely different perspective and moderate conversations. This make up was key. We were able to give each other different viewpoints and constructive feedback. We worked no less than 45 hours on this unit, that would only last two weeks. Challenges: We started this unit on day 4 of school. We started this unit with freshmen. It was very easy to get them hooked. They wanted to write and discuss the concept of balance and how things related. They liked exploring with the stations and working in the room as well as the library. It was great to be able to give them non-math tasks. The students were excited to choose their own topics for researching and making connections. Honestly, the first 7 days were great and going just as planned. Once they had their topic, they struggled. All of the students were able to connect balance to their topic, but found it very difficult to connect it to math. The media specialists, myself and my co teacher all had to work with students one on one questioning them through their progress. It was exhausting. These were probably some of the most inspiration and draining days of my teaching this far. Students wanted us to give them the answers. They expected us to lead them in the right direction. We held strong and let them work through their frustrations. It took an extra day or two for them to actually get facts and information gathered and their thoughts together. Once that happened it was presenting time. We left the options for presentation open, and this lead them to have a lot of anxiety. Many did not want to present. Many did not want to complete a project. Many were so tired of the loosely structured classroom that they were unwilling to persevere. They did though and we came up with some great products. Rewards: We had several students who would not have been interested in math rapping about math. One student was so very excited that he could use this as an excuse to learn coding skills to talk about a career in coding and how it relates to math and balance. We had students coming out of their shells and presenting. We also had students who were not usually interested in math, that were now excited to come to class. So while the concept wasn’t grasped by all, it had a huge positive impact on the students. Recommendations: I would recommend this unit to any math teacher. Balancing equations can be used at almost any grade level. I do not recommend doing it in the first week of school. I would say you need to have structure, routine and respect in place before moving on and starting this lesson. Having a “background” of structure and allowing the students to get to know us for longer would have helped tremendously. Special Education and GID- About Me! My name is Amanda Biddle. I work at Henry Clay High school in Lexington, KY. Henry Clay is the largest high school in Kentucky with about 2, 400 students from grade 9 to 12. I am currently the building assessment coordinator, however I was, and will be again, a special education teacher in our building. I have two lovely little boys, 6 and 2. I have experience teaching special education in all subject areas in elementary school, special education in middle school, and special education algebra and geometry in high school. I have a passion for working with students who are struggling learners and finding ways for them to learn how they learn best. I believe that each student can be successful if they are given the right tools and encouragement. I was introduced to Guided Inquiry through my husband, who is a social studies teacher. While completing his masters program in library science, he had the opportunity to study and implement Guided Inquiry. He started with advanced classes and worked his confidence in to the general education, co taught classes. It was through long nights of planning his lessons and unit together that I started to understand how this model of teaching and learning could benefit, my then language arts students who were in special education. I was able to take his knowledge and work with him to form a unit on guided inquiry. That was three years ago. Once the librarians, other math teachers and I started working together and really looking in to GID and how it could benefit our students, we were able to sign up for the GID Institute at Rutgers this summer. We formed a team of 1 math teacher, 1 English teacher, 2 librarians and me, the special education teacher. Going to the institute and working 45+ hours on one unit was exhausting, but worth every minute. I was able to come back this school year, ready to start the year by giving students a new perspective on how they can learn and explore math. I am excited to be a part of this 52 week challenge. In my last post I spoke about the value of Third Space at the Identify stage: allowing the personal interests and passions of the student to find synchronicity with the curriculum. Allowing students the opportunity to select an area of personal interest, and to allow them the choice of presentation mode goes a long way to ensuring engagement, a quality product and a wonderful sense of achievement and improved self-esteem for the student. So can “Third Space” be applied to the Open phase? At this beginning phase, surely the “Hook” to engage all students with an item of personal interest would be impossible to find. And isn’t that the aim of Immerse and Explore: to allow students time and space to find their area for study? So, is “Third Space” relevant during Open? To me, finding the “Third Space” during Open is all about asking students to become personally involved with the topic. They are not asked to find a specific area of interest yet, but engaging activities in this phase still employ the same principle: of connecting the student to the topic, and making it “relatable”. I have tried to employ this principle when working with a Year 5 (10 years old) class who were studying the Gold Rush in Australia in the mid 1850s. The objective of the unit was to consider the effects of the Gold Rushes upon the people involved: the miners, their families, those who plied a trade on the fields, the government etc. This clearly required a level of personal empathy; as this was somewhat out of their immediate experience (! ), I tried to think of how to engage them with their heart, and not their head. So I devised an activity where they would adopt the role of a miner. We provided groups with a map, and a box of goods. Some boxes contained useful items, others not so; some contained a miner’s licence, others not. We spray painted some rocks gold, and “buried” them in an area of the school (in long jump pits, inside tyres, behind posts etc. They were then given 20 minutes to try their luck! I posed as the Licence Inspector; those without licences were sent to gaol! Some found little, others a lot; some stole in order to get rich! (just like the real thing!) The students were amazingly engaged, and most of all, during our de-brief, they demonstrated that they had a very good understanding of some of the difficulties the miners encountered, and the feelings that they might have experienced. They were now ready to learn! Hello! I hope that you are all enjoying the beginning of summer. I am Marci D’Onofrio. I work at Westborough High School in Westborough, MA teaching ninth grade science. Up to now, the course has been Physical Science. Next year, we are changing the curriculum to a project based learning course titled Natural Science and Engineering. Most often when I think about GID, I think of the relationships and personalities of coworkers involved. This type of project requires a large amount of conversation while coaching students through a sometimes confusing and definitely challenging journey. In my opinion, the rewards of this type of work far outweigh the meaningful struggles. What really strikes me about this process is that the teachers and students alike experience the emotions of this journey; it is confusing, challenging, and rewarding for all. In conjunction with Anita Cellucci, I have been working on the Science Inquiry GID project for four years no. Each year, the group of science teachers working together has changed. And, since we all learn differently, my explanations and conversations have had to evolve. It quickly becomes clear when I am not communicating well, when the process is unclear, and when the project piece is clearly understood. I have learned that vulnerability has to be part of the experience as I become aware of the strengths and weaknesses in my communication of the GID process. I have often commented to our school librarian, Anita Cellucci, that GID brings out the individual learning styles of both the students and teachers. Personally, I feel that my strengths and my weaknesses are in clear view. So, my first blog needed to briefly reflect on the teachers themselves. One of my favorite aspects of GID is the creativity that is built within the process. I see endless possibility in the ways in which Guided Inquiry Design can be intentionally designed for any discipline. Like an artist’s pallette, there are infinite colors possible. Looking at the process in this way allows me to really think critically about how the process can help students be motivated to learn, engage in the learning process and develop empathy for other learners. Over the past four years, I have collaborated to design projects in Science, various English classes, Fine Arts and History. This past school year, I worked with Academic Support classes and their teachers, Molly Lonergan and Anita Breeze, on a project entitled “Understanding Your IEP”. Students read and reflected on their individual IEPs and were given activities and strategies that would enable them to read and focus on the parts of the legal document to help them within their daily lives. As I met weekly with these students, I was able to reflect on the process, their learning, and the barriers to motivation, personal growth and most importantly trust within the classroom. It was clear to me that before we could engage in research, we would need to create a safe space and the opportunity for curiosity. Unfortunately, it is often the case that students on IEP’s arrive in the high school in a very different emotional space than is intended. Many times, these students have not been asked to share their thoughts about their learning, but are often told all about their learning style, the modifications that will best serve them and often – how to think. Because of these factors, we began the Guided Inquiry design process with activities and lessons based on the habits and attitudes of mind research of Angela Maiers. The GID phases included activities about self-awareness, interest inventories, transition planning, self-disclosure, and crafting personal statements. These activities were done through online inventories and surveys, reading materials to gain knowledge, and self-reflection in the conference room of the library. 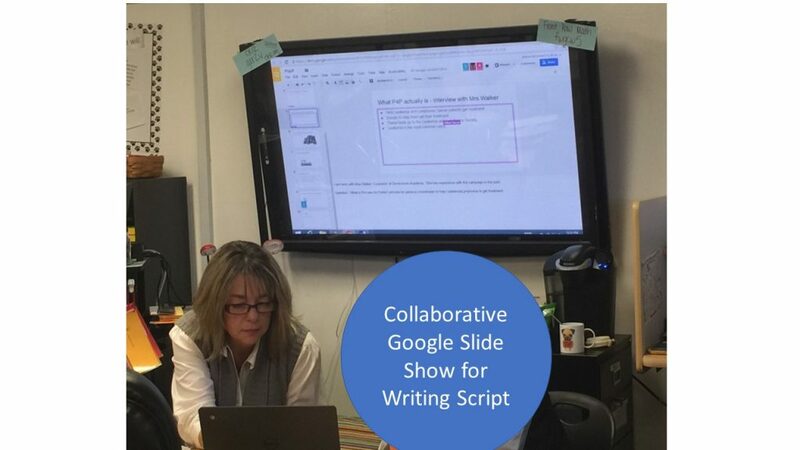 The culmination of the project was a Google slides presentation that students were then able to use within their IEP meetings to successfully advocate for themselves as well as a Disclosure statement that can be used post high school. Students were given the “space” to experience their feelings within this process – GID allows this through the reflective aspect within each phase as well as the ways that each phase acknowledges the emotional aspect of the process. Like other GID projects at Westborough High School, Inquiry Tools were embedded throughout the project to assist students in moving through the phases, as well as staying organized within the project. With this group of students, the Inquiry Community became invaluable to the learning as students gained trust with the adults in the room as well as their peers. The collaborative aspect of this learning process was facilitated through the phases of the process. 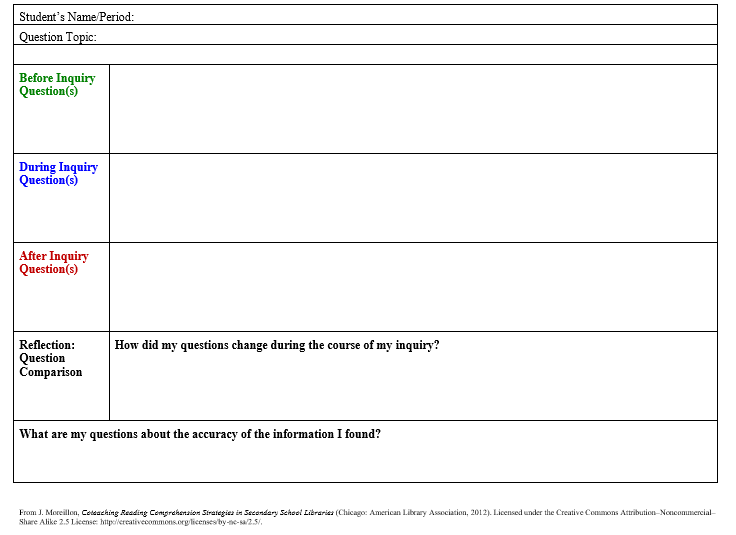 The Guided Inquiry Design Process Model was implemented to help students find a course of individual study that would allow them to think about their plans for their post high school lives. It enabled them to engage in research that is based on their needs and individual growth. Student Example: One person on a student’s “Dream Team” – Angela Maiers speaks of the importance of creating a personal “Dream Team” of individuals that influence your thinking and who’s behaviors you would seek to emulate. Today, I thought that the Inquiry Process ran very smoothly. Unlike most people my age, I enjoy each step of the process and take time to consider each part before writing. Last year, I found that the Inquiry Process was very successful in helping me to boost my curiosity regarding a topic that I had very little interest in. For these reasons, I appreciated and still continue to appreciate the Inquiry Process. My feeling on my IEP: I really don’t like my IEP. I hate how it has disabilities in it. It makes me feel like I am less then other kids that don’t have them. I do recognize that I struggle a little in some classes but i don’t think i need an IEP. I feel like that an IEP is just stating the problems you have, recognizing what I lack in classes. I think I have a good memory, my reading skills are getting better. I think it can be helpful sometimes, but other times it’s very annoying. I hate the 50% more time on test and things. I just don’t need it. But I love being able you use a calculator. I want to be treated like normal kids in normal level classes. I don’t want to get all this special baby treatment on how I need more help then all the other students. If i need help i will find help, I don’t need someone constantly helping me with things I don’t need help with. My IEP is very outdated and not accurate to who I am now. I am a much better student than the old IEP says that I am. I struggle most with advocating for myself. Today in class curiosity was investigated. there are many things that had made me think in the Personal curiosity inventory. But none made me think more than the question about what are my questions. Working with GID in this way, allowed students to access the curriculum in a way that fit their individual needs while giving them valuable information literacy, technology and the process skills to dig deep into an emotional topic. In our follow up meeting, the teachers and I decided to move forward with GID next year and continue to add depth to the project.Students gained valuable awareness about their own learning as well as traits and qualities about themselves that are sure to help them through the rest of their school career and post high school plans. I am grateful that the special education teachers were willing to take the time and put the effort necessary to provide this experience for our students. When I learned how effective Guided Inquiry could be, I got excited about planning a GID-based writing workshop. I focused on Reconstruction because it’s the setting for my book, but the model could be adapted for any historical time period. On my website I’ve posted the materials you’d need to lead this workshop in a middle or high school classroom, and I’ll run through the steps quickly here. The “Open,” “Immerse,” and “Explore” stages are the same as I mentioned yesterday: show the book trailer, read BROTHERHOOD, ask students to connect to content, and begin to research Reconstruction. When I visit schools, I show a series of photographs, and students point out the details—clothing, means of transportation, food, etc. My favorite is this shot taken at the wall in front of St. John’s Church in Richmond, VA, in 1865. Notice that the people are wearing coats and hats, but most have bare feet. During the “Identify” stage, I ask students to write a scene based on a newspaper article from the era. I encourage loose, messy, fast writing. I interrupt them with sound effects (church bells, horses, crickets), and ask them to incorporate the sounds into their scenes. The process here isn’t about producing good writing. It’s about entering into the time period vicariously. Next, students swap newspaper articles and write a second scene—again, loose, fast writing. Then they pause and I ask which scene they liked most. Which did they prefer writing about, and why? What did they find compelling, disturbing, or interesting about the one they preferred? Their answers kick off the “Gather” stage of the GID process—the stage when students begin to ask their own questions. This step is the essence of Guided Inquiry. It’s the reason GID is so effective. Whether students prefer scene A to B, or B to A doesn’t matter. What matters is that they prefer one. Students will always prefer one. Always. And the moment they articulate why they like one better than the other is the moment they really begin to invest in the subject matter. It’s an exciting moment to watch! They’re given permission to make a choice, express an opinion, and be heard, and the process empowers them. In the “Gather,” “Create,” and “Share” stages, students’ individual or group projects go in any number of directions, and I leave that part up to the teachers. Some have particular themes they’d like the class to address. For example, in my previous post I mentioned that the teacher wanted students to think about gangs—all types of gangs and the conditions that give rise to them. Or teachers might want students to think about voting rights (who feels threatened by another’s right to vote?). Or maybe students will create and share presentations about citizenship and what it might feel like to live in America today and not be a citizen. Or they might talk about the problem of bullying. GID allows for flexibility! I began this post talking about Reconstruction, and in only a few paragraphs, I’ve raised a myriad of topics, but that’s because my novel raises them (the Reconstruction-era amendments established birthright citizenship and voting rights; if your class is focused on a different time period, your students will ponder a different set of issues). From my perspective—hey, I’m a writer, so I have to nudge students to write, no apologies!—an easy exercise in loose writing gets the process going strong. And when students reflect on issues that matter to them, personally, and are in a safe space for reflection, wow! Sharing happens. Listening happens. Learning happens. I love the way GID promotes a student-centered and student-directed approach to learning (so much more effective than the memorize-and-regurgitate model of my youth). Like I said in my first post, boy do I wish my teachers had used Guided Inquiry when I was growing up. Thank you, Leslie, for inspiring me and the next generation of educators!